Konstantinos Manolas is a footballer currently playing for Italian Serie A club AS Roma and the National Team. Manolas singed his first professional contract with Thrasyvoulos in 2008 after coming through their youth team. After one season he moved to AEK ahead of the 2009-10 season and stayed for three seasons, before joining Olympiacos in the summer of 2012. Manolas has gone on to be a key member of Olympiacos’ first team as well the national team. In the summer of 2014 he transferred to AS Roma. 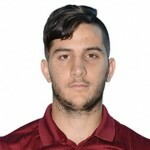 Manolas has represented Greece at U-21 level and now the senior national team. He participated with the National Team in the FIFA World Cup 2014 in Brazil.